A buckler was a small shield that was held in a fist grip during close combat. 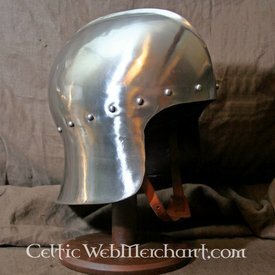 It was a popular form of protection among infantrymen from the 12th to the 17th century and it could be held in both hands. Despite of its small size it was very effective in deflecting blows of the opponent. 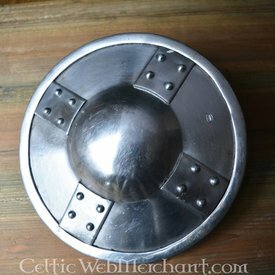 This battle-ready buckler is made of 2 mm thick steel and it has a steel grip. Its diameter is 38 cm and it weighs 2 kg.